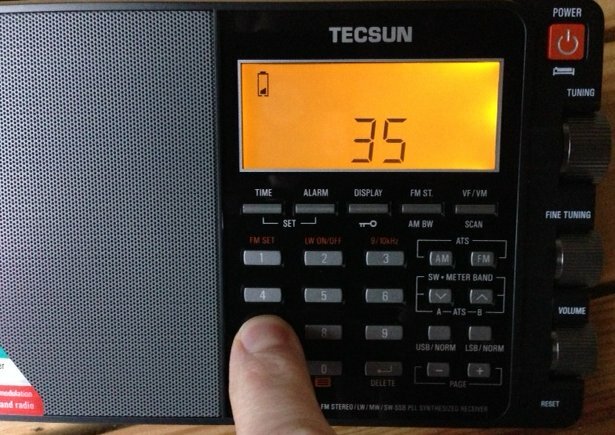 Many thanks to SWLing Post reader, Joost, for discovering and sharing yet another hidden feature of the Tecsun PL-880. 1.) Turn on the PL-880 and select the FM radio band. 2.) Press and hold the number 7 for three seconds, the current line-out level will begin flashing. 3.) Use either tuning control to change the line-out level. Unfortunately, it seems that the line-out level only works on the FM band (at least, on my firmware version). That’s a shame, too, as my shortwave and AM line-out levels default to a value that is much too high for a recording device, rendering the port useless. I value line-out for making reliable digital recordings while monitoring activity via the radio’s built-in speaker. I hope this will be fixed in the future as I’m sure it can be addressed with a firmware update. On a side note, I’ve been getting a lot of inquiries about a full PL-880 review. I’m nearing completion of it now–about 75% complete. It’s a rather long review and (I hope) will be useful. The ‘880 has so many features (both documented and hidden) that writing a review is a daunting task! Check back soon! This entry was posted in New Products, News and tagged PL-880, Tecsun, Tecsun PL-880, Tecsun PL-880 Firmware, Tecsun PL-880 Hidden Features, Tecsun PL-880 Line-Out on December 10, 2013 by Thomas. Thanks very much for helping me with that information. I have done exactly what you suggested on all am bands. After playing the radio on a strong MW station for 10 minutes the volume suddenly increased and after a few minutes dropped down a bit.. I will let you know how it is functioning over the next few days. My firmware version is also 8820. I really appreciate your help. THANKS. Hi I received this radio 4 days ago from Anon. After 2 days its volume levels have started to malfunction. On AM and SW the volume suddenly dramatically increases and then just as suddenly drops right away again. I have tried leaving the batteries out for a few hours and even pushing the reset button but so far it makes no difference. I have other radios that do not behave like this. This is my first Tecsun. I would appreciate any help or advice on this thanks . I notice your battery is dying. What kind if battery life can we expect in typical use? Any luck zeroing the frequency? Any comment on the radio being triple conversion? I was holding out hope someone else would comment on whether or not the PL-880 could be considered triple conversion. I simply don’t know enough about this ybrid DSP configuration to authoritatively say. Regarding battery life? It’s excellent. I bet my PL-880 will run for 15 or more continuous hours on one charge. Possibly much longer. I’ll have to test this on its own with the radio set to a moderate volume level.